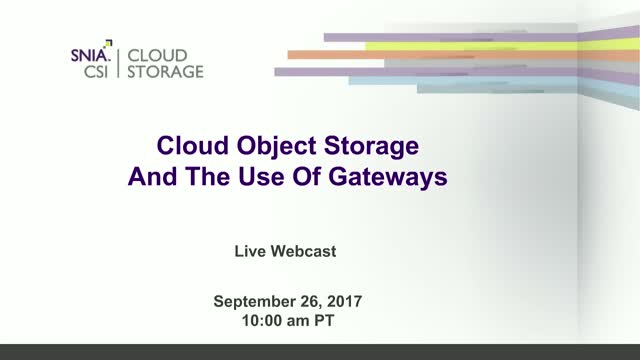 The use of cloud object storage is ramping up sharply, especially in the public cloud, to reduce capital budgets and operating expenses. However, enterprises are challenged with legacy applications that do not support standard protocols to move data to and from the cloud. Enterprises have developed strategies specific to the public cloud for Data Protection, Archive, Application development, DevOps, Big Data Analytics and Cognitive Artificial Intelligence. However, these same organizations have legacy applications and infrastructure that are not cloud friendly. Object storage is a secure, simple, scalable, and cost-effective means of managing the explosive growth of unstructured data enterprises generate every day. Gateways enable SMB and NFS data transfers to be converted to Amazon’s S3 protocol while optimizing data with deduplication and providing QoS efficiency on the data path to the cloud.